The story is told by Elena and centres around her friendship with another girl of the same age, Lila. Both girls come from similar backgrounds in a poor area of Naples. Both are intelligent, but Lila's brilliance is innate whereas Elena has to work hard and study to match her friend. The book details their childhood, their families, friends and education. Life in 'the neighbourhood' is hard and the girls are used to having very little. The domestic acts of violence they experience (Lila's father once throws her out of a window) are echoed by evidence of adult violence and crime on a larger scale that forms the backdrop to their lives, noticed but not commented on because it is such an everyday part of their reality. Despite the difficulites of their existence there is still room for warmth and tenderness. The central relationship between Elena and Lina is a complicated web of competition and affection between two kindred spirits. The reaction was overwhelmingly positive with most saying they loved it. It is a strong, vibrant piece of writing that we found extremely compelling although we were divided as to whether we would go on to read the other books in the quartet. We discussed whether the book is a 'female' novel but it was agreed that the male characters are as interesting as the female ones and that there was just as much to appeal to male readers. 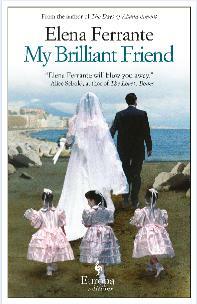 Although the central preoccupations of the novel are domestic – the small everyday practical concerns that traditionally tend to be the preserve of women – the brilliance of this book is that Ferrante manages to use this to tap into themes of friendship and rivalry that are universally appealing. We thought the first person narration was handled exceptionally well; we see everything from Elena's point-of-view but we also understand how distorted her own perception can be. Many commented on how well the author evokes childhood; innocence mingled with vicious self-interest and the vivid bonds formed between children that evolve and change as they grow older. And the wider sense of place was incredibly atmospheric; we all felt we had lived and breathed the crumbling streets of Naples. Without hesitation to anyone looking for a memorable, absorbing and compulsive read. Elena Ferrante is a mysterious and intriguing figure. A detailed interview from The Paris Review here. I loved it. There was nothing I didn't really enjoy about it. The characters were convincing. The plot was a fascinating mixture of the banal becoming important and the fantastic being projected on to the everyday (such as the copper pot exploding in the kitchen). It is unlike anything else I have read for a long time. I have never read anything that depicted childhood in a way that accords so closely with my own memories. Childhood is not a time of innocence as it is so often portrayed. But as the children got older I was less interested. Overall, though, I found it a very compelling story set in a place and time I didn't really know anything about. And although nothing really happened I was right there and I found the language really beautiful, for which we should also credit the translator. The characters were real to me and really strong and I thought the portrait of friendship it painted was utterly convincing. I loved the sense of place. A book that can make you want to keep reading when really nothing much is happening is a powerful achievement for a writer. I was captivated by the teenage years. It felt so utterly real for me, the yearning for a meaningful life, an intellectual life, and that experience of being utterly bewitched and captivated by someone who is your friend. And without any literary artifice its genius is in what it manages to convey about the human experience. I demolished this, and then the second, and then the third and I'm about to start the fourth one. I love the darkness in the relationships between the girls, their competitiveness and mutual jealousy. "My Brilliant Friend", she is like a firework, everything she does she naturally does well, whereas Elena has to work and study. And I was both frightened and fascinated by the oppressive world they live in. I love coming-of-age stories and this was the most descriptive one I've ever read. I found the storytelling really beautiful and immersive. But I found I couldn't always trust Elena's voice. And I was shocked by the violence of Naples. I enjoyed this and found it incredibly vivid. But it didn't surprise me particularly or take me anywhere new. I didn't love it with a captial 'L'. Possibly the fact that it was all told from one point of view; I think I prefer a slightly more complex viewpoint. I love it when a good book comes along and devoured this, only begrudging the late nights as I stayed up to read just a bit more. I loved the apparent simplicity of the writing while the underlying ideas and events were complex and always intriguing and surprising. I was fascinated by the interrelationships between the characters and the evocation of Elena's world from the inside out. I felt a certain truthfulness derived from the author's own experiences that kept it utterly real – and if in fact it was all invention then I admire the author all the more for her achievement.